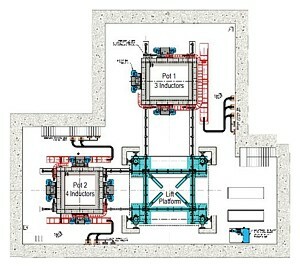 In-line, Perpendicular, L-shape, even single pot shared between two parallel CGL projects. Ajax provides Bogie assemblies for mobilization of coating pot. Bogies allow the furnace to be moved from lift platform to ambush station. 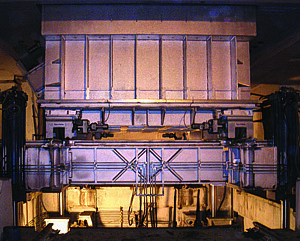 Two bogie assemblies are mounted on each side of furnace base. Each assembly consists of a pair of flanged wheels mounted in bushed bearings and supported on a rigid frame. Each bogie is attached to the furnace base by means of a fixed pin passing through a bearing carried on the bogie, thus providing fully articulated movement and equal load sharing between the wheels.